Are the days of pushing a heavy mower around your garden gone? At the beginning of summer we excitedly received delivery of Robomow's latest robot lawn mower - the RC304. We expected lazy days to follow, catching rays and sipping mojitos while the efficient little robo worker looked after the garden. In reality, it's not quite the utopian future we wanted, but it is pretty cool. Read on to discover the highs and lows of owning a robot lawnmower. It's a robotic lawn mower, which will mow your grass without you having to lift a finger. Almost. People who really dislike mowing their lawn, people short on time, and early adopters. We really like the design of the Robomow. It's really modern and stylish, but the dark green colour means it'll blend in with most gardens. The top features a button panel which can be used to set up and control the robot. It runs on three wheels. The two rear wheels are motorised and the front is like a shopping trolley wheel. Underneath is a metal blade which measures 28cm across. It's a reasonable size at 63 x 46 x 21 cm and not too heavy, weighing 11.1 kg. We think it's the best-looking robot mower around. The base station is well designed as well. It's lightweight and thin, but also very strong. One of Robomow's professional installers came around to make sure the RC304 was installed correctly (rather than let me botch the job). The installation took around an hour, which isn't too bad at all. It's also possible for buyers to set up their own robots, which would take around two or three hours depending on how good you are at following instructions. The setup is pretty simple. A wire needs to be laid around the edge of your grass (so the robot knows where your lawn stops and flower bed begins) and this is fixed in place by plastic pegs hit into the ground. At first, the wire is clearly visible on top of the grass and is quite unsightly, but over time it sinks into the soil and becomes almost imperceptible... almost. After the installation it rained for a solid week, naturally, so we couldn't use it. The Robomow actually has a rain sensor on board, and won't begin a scheduled mow if it senses wet conditions. That's pretty smart and stops it from accidentally destroying your lawn. After everything had dried out, it was time to test the mower. The new range of Robomowers can be controlled from an app. So I didn't even need to go outside and risk getting sun burnt to start the mowing process. Of course, the lawn does need to be cleared before you start - especially if you have a dog that poops. 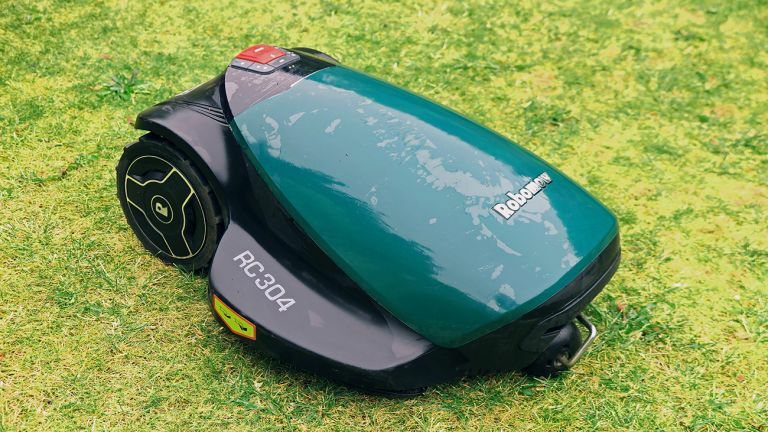 The Robomow mulches anything in its path, spreading a fine dust of dog mess over your lawn which is apparently very hard to clean. Thankfully I was warned about that before I made a smelly mistake. Kids toys and other gardening equipment also needs to be cleared - these aren't as intelligent at navigating as robotic hoovers, and whereas a robot hoover will merely eat your sock, a robot mower will shred it into a thousand pieces and spread it over the lawn. Probably. So I set what cutting height, then started the mower from the app, and watched, mesmerised as it zig zagged around the lawn, leaving neatly cut grass in its wake. It's very satisfying to watch. As previously mentioned, navigation on the RC304 is a little rudimentary - it's no Dyson 360 Eye. It'll go in a straight line until it hits the border, then it'll turn around and go in a different direction. It doesn't know where it's been, but when you first setup the 'bot it'll ask you to specify how large the garden is - with this information it'll work out how long it needs to run before all the grass is covered. We never had a problem with it missing patches, but if the RC304 did miss a patch, it can be controlled via a virtual joystick in the app. Like something from Robot Wars. What really hits you is how quiet the Robomow is. It sounds nothing like a traditional lawn mower - more like a high powered fan. After a while I got bored and went to watch Netflix while it finished off the lawn. Futuristic. It takes around an hour to complete, and because it mulches the grass, there's no bin to empty. The following weeks I set the Robomow off at irregular intervals - just when I thought it looked like the grass did need doing. You can set it up to mow at the same time every week, or even every day, but I preferred the slightly more manual method. The Robomow is pretty good at doing the edgeswith its large blade which extends past the wheelbase, but still requires a strimmer to keep things tidy once in awhile. The app worked most of the time, but did occasionally drop connection to the mower. Such is life with IoT devices in 2016. After several weeks of solid mowing, the RC304 started to dig a hole in part of my lawn where it was struggling to get traction. Foolishly I left it, until one day it cut through the guide wire. Luckily it didn't continue to destroy my prized geraniums, but it could have done. This did result in me having to rewire the garden, which is no small task if you have a large patch of grass. There is a repair connector which would have saved me from needing to rewire, but I only found out about that after I had done it. The Robomow RC304 looks really great and does an excellent job cutting the grass with the wide metal blade. It's also very smart, with a well-designed app. It's very useful time and labour saving device. It's also impressively quiet and there's no bin to empty. It's not as smart as we'd like - similar to an early robot hoover. It dug a hole in our lawn. And it costs a fair few pennies. Be aware that buying one of these you're still a relatively early adopter - it's not as smart as the recent crop of robot hoovers. But I hate mowing the lawn, so to be able to press a button and have a robot do it for me is a massive win. It does cost £1,199 though, and my garden just isn't large enough to justify spending that much on a mower. Maybe yours is, however?